The South-Derby Bayern v VfB Stuttgart was a surprisingly tight affair until the 71′ minute. In the end, Bayern’s class, however, was too much for a hard-working Stuttgart side that never had any realistic hope of collecting three points at the Allianz Arena. It didn’t take Bayern long to get on the scoreboard in this one. In the 5′ minute, Robert Lewandowski was denied by Stuttgart keeper Ron-Robert Zieler. However, Thomas Müller jumped on the rebound and played the ball back to the centre where Thiago was given to much room to score from about 14-yards out. Bayern kept up the pressure and had further chances Kimmich saw a ball go just wide of the far post in the 7′ minute. At this point, it seemed to be only a question of time until Bayern would score again. But the minutes ticked by and, instead, Stuttgart slowly worked themselves back into this match. In the 26′ minute, Stuttgart got the well-deserved equaliser. Anastasios Donis won the ball in midfield and was given to much space to roam, but instead of pressing into the box the Greek forward unleashed a shot from 22-yards out that in the end was unstoppable for keeper Manuel Neuer. All of a sudden the game was wide open with Stuttgart producing the next big chance of the game. In the 33′ minute Steven Zuber was given to much room on the left, and his cross found a wide open Donis inside the six-yard box, but his close-range effort was stopped by Neuer. On the other side, Kingsley Coman unleashed a close-range shot from an almost impossible angle that Zieler had to do well to tip over the bar (37′). The French winger then appeared to have scored Bayern’s second in the 44′ minute, dancing through Stuttgart’s defence Coman unleashed a low drive from inside the box that hit the side netting only. Bayern head coach Niko Kovac then made a significant tactical switch during halftime. Javi Martínez was taken off and replaced by Serge Gnabry. As a result, Thomas Müller was moved from the wing to the centre and Leon Goretzka further back from the number ten position to the number eight position. The switch paid off in the 55′ minute. Robert Lewandowski came crushing into the box but was stopped by Zieler, who was left stranded on the ground, in the ensuing confusion the ball eventually ended up with Serge Gnabry, and his shot was deflected by Christian Gentner to make it 2-1. But it remained a wide-open match with chances on both sides. In the 63′ minute Stuttgart almost equalised, but Nicolas Gonzalez’s shot from close range hit the post. Almost immediately going the other way Lewandowski broke into the box and was brought down. The Polish striker stepped up himself to shoot the penalty but only hit the post. Bayern did get their third in the 71′ minute after all. A corner from the right was misjudged by Zieler allowing Goretzka to head the ball home from inside the six-yard box. That goal took the fizz out of the match, Bayern now managed to easily circulate the ball and Stuttgart were unable to create any further chances. Instead, Bayern added a fourth. In the 85′ minute, Joshua Kimmich picked out Lewandowski’s run in the box, and the striker made no mistake beating Zieler from close range. Shortly after Niko Kovac handed Canadian wunderkind, Alphonso Davies, his Bundesliga debut. But the Canadian had no impact on a game that Bayern dominated in the last 20 minutes. For the second week in a row, Leon Goretzka was the man of the match for Bayern. The midfielder told kicker in an interview earlier this week that he feels he has finally arrived in Munich. His performance on the pitch underlines this, and after scoring two goals last week, he added another this week, at a crucial point of the game too. 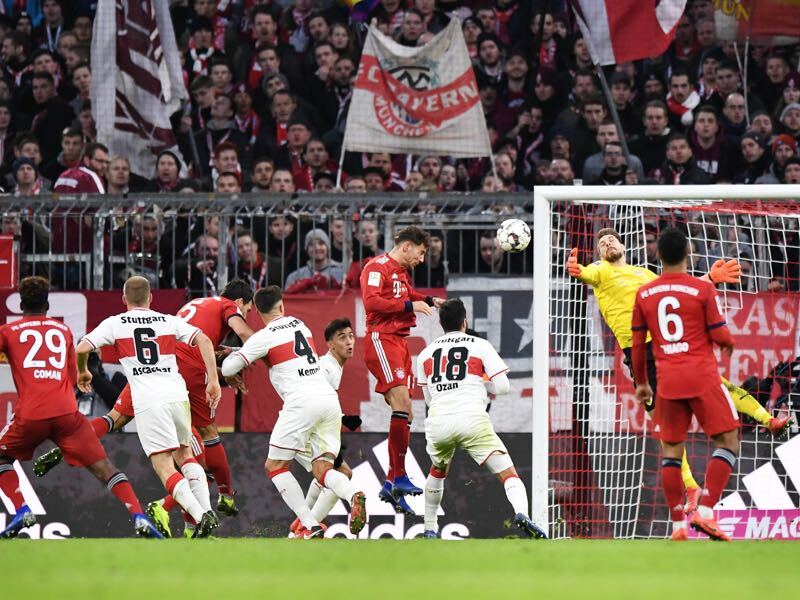 Stuttgart were pressing for their second equaliser of the game when Goretzka headed home a corner kick in the 71′ minute. But it wasn’t just his goal that won him the man of the match award, Goretzka also showed his tactical flexibility by starting in the number ten role but then moving back in a more defensive position to play as a number eight in the second half, which allowed Bayern to bring on the speedy Gnabry. Complacency remains an issue for this Bayern side. Bayern started very well in this game and should have scored two or three in the first 20 minutes. But the Bavarians then took the foot off the pedal and allowed Stuttgart to get back into the game thanks to a wonder goal by Donis. 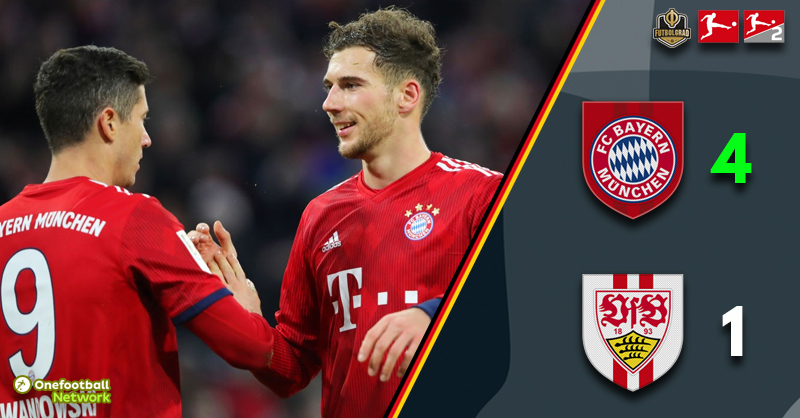 While they were able to correct that error against relegation candidate Stuttgart Bayern can not allow this sort of complacency against better Bundesliga sides or in the Champions League clash against Liverpool, who on current form will be favourites in the games against Bayern. Bayern have not lost the first game of a calendar year since their 4-1 home defeat to Karlsruhe in 1996. Alphonso Davies becomes the first Canadian national team player to play for Bayern München in the Bundesliga. Anastasios Donis had a hand in three goals in two away games against Bayern (two goals, one assist) scoring two of his five Bundesliga goals against the Bavarians.